Week 2 of Apples consisted of more Macintosh and Spartans. Going into to the week I had no idea what I was going to do with the apples. The thing with being the work baker is that when co-worker's have birthdays come around there is an unspoken but expected rule that I should bake something. I did however have several things going on this week, so I was tight on time and ingredients. I get home on my day of baking to find out I only had 1 egg when I thought I had several. Uh-Oh, what to bake now? I could make an apple crisp but I wasn't really in the mood for that and I knew I would be baking one for Thanksgiving. I aimlessly stood with the refrigerator door open, nothing. Opened the freezer door, shifted some things around.... well Hello, frozen puff pastry. That will do in a pinch. Apple strudel with puff pastry it is. 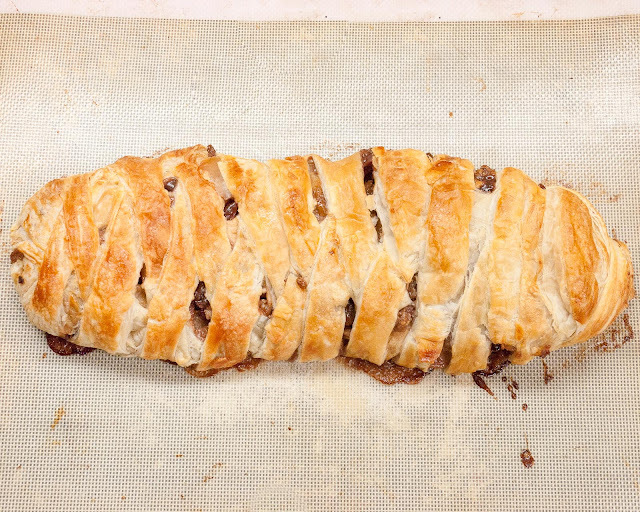 How could I kick this up a notch and put some life in to this strudel? One - I will add some cranberries and walnuts, Two, I will add some bourbon! 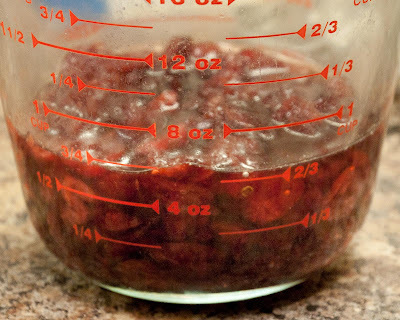 1) Place the cranberries in a measuring cup. Add 1/4 cup bourbon and enough warm water to cover the cranberries. Allow them to re-hydrate for at least 5 minutes. 2) Sift the sugar, flour and cinnamon over the apples in a medium-large bowl and toss together. 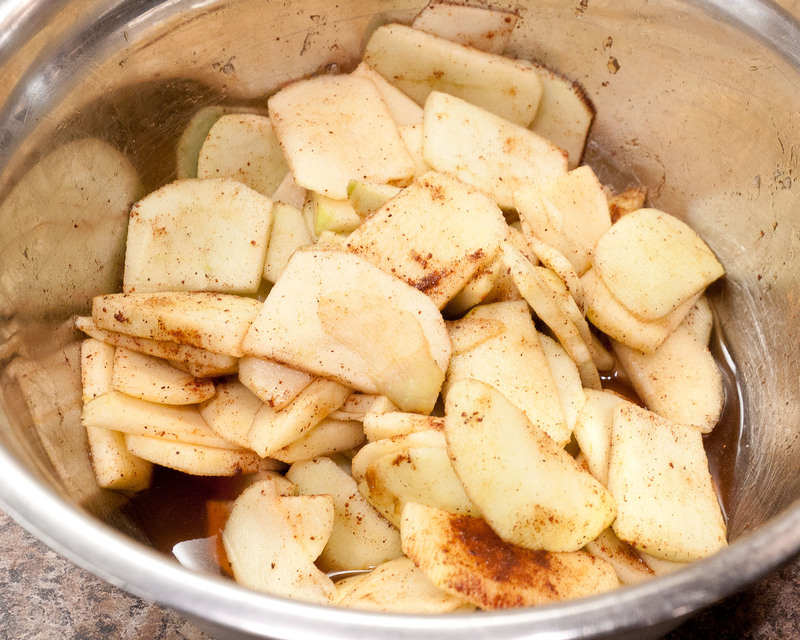 Sifting the flour with the sugar and cinnamon prevents it from clumping on the apples. 3) Heat a medium sized pan/skillet on medium-high, drain cranberries. 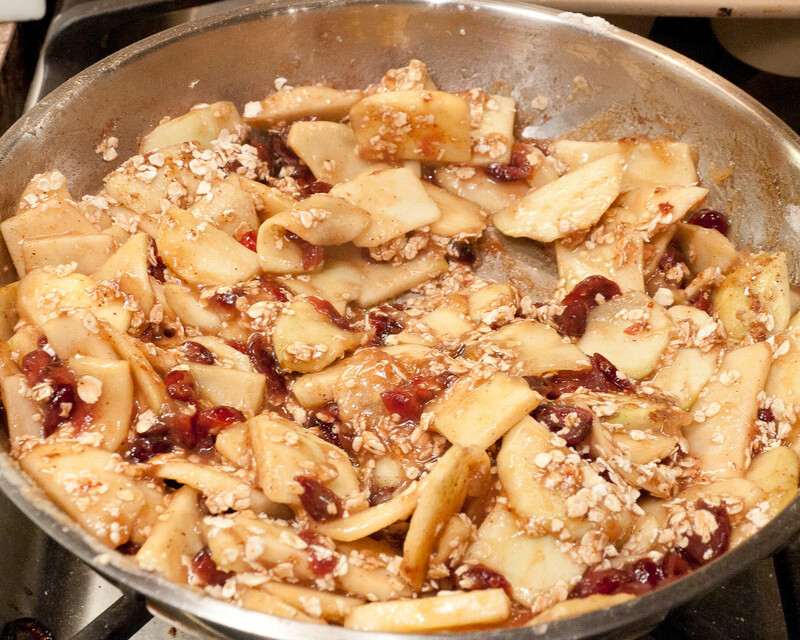 Add apples and drained cranberries to the pan to soften apples slightly. Add bourbon, saute 2 minutes to release the alcohol and thicken. There should be very little liquid left by the time you need to add the oats. Add oats and walnuts and stir to combine. Remove from heat. 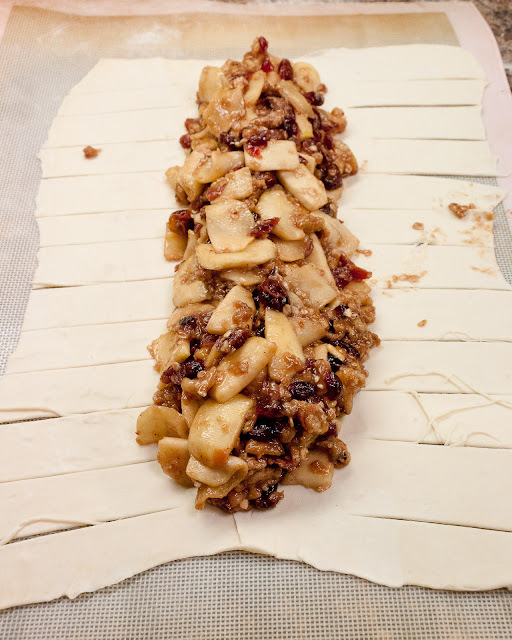 4) Roll out the puff pastry to a rectangle, about 2 1/2 ft by 1 ft 4 inches. You want enough width across to place the apple mixture in the middle and have about 3 inch slits up the side to cover the mixture. Using a pastry cutter/wheel, cut slits up each side, about an inch thick and 3 inches long. It doesn't have to be exact, just enough to wrap over. 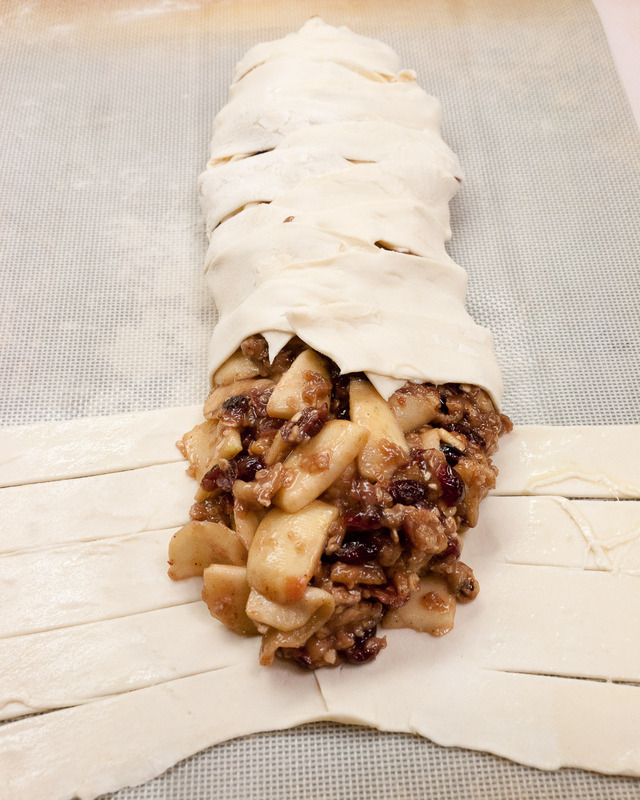 5) Place the filling in the center of the dough, where there are no slits. 6) Once you have placed all the filling in the center, begin to wrap the filling with the tabs you created starting at one end. Work your way to the other end crossing the tabs over each other covering most of the mixture leaving small openings for air release. Tuck the ends in so they are sealed and no filling can leak out. 8) Bake for 45 minutes on parchment paper or a silpat, the outside is fluffy and golden brown. This is a great recipe in a pinch. It is pretty quick to put together with some great flavour. 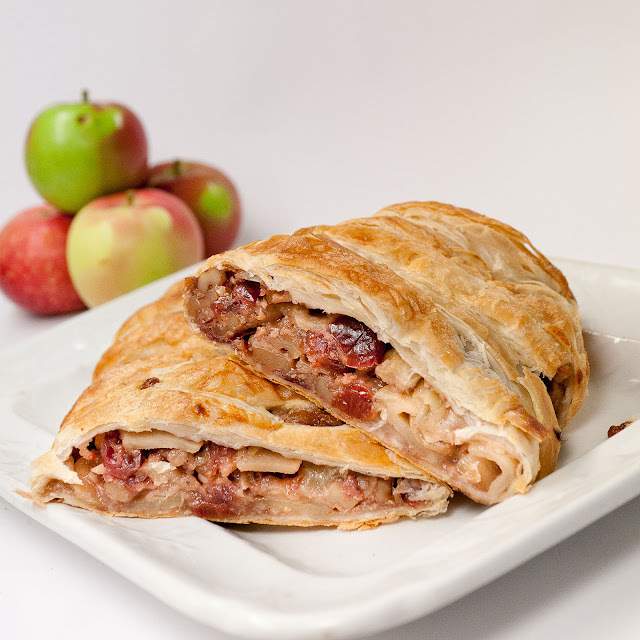 The puff pastry is flaky and buttery and you get a lot of great texture from the apples, cranberries and walnuts. You don't always have to bring cake when it is a birthday. My co-workers were quite happy with this beautiful fall dessert. They also enjoyed it since puff pastry makes you also think of croissants and turnovers, they could easily call this breakfast and take a slice before noon. This is a great post. It has a tasty recipe, step by step photos and the instructions are very clear. I could not ask for more-well done! Hi there! It looks so good, and from what I saw it's easy to make! I love strudels. And this strudel looks so yummy. Great job.